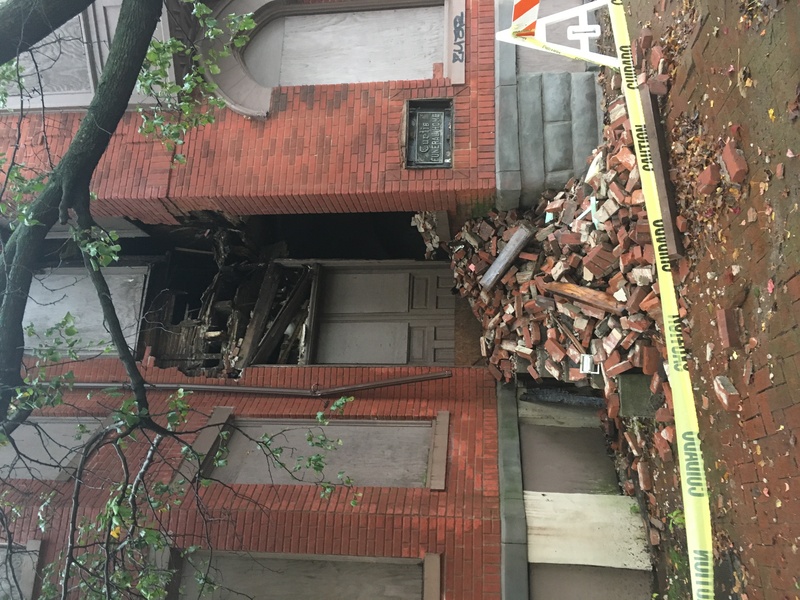 Home » Uncategorized » Historic mansion in Midtown Harrisburg suffers partial collapse. 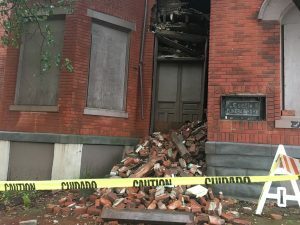 Historic mansion in Midtown Harrisburg suffers partial collapse. The former Curtis Funeral Home at 1000 N. 6th Street on Tuesday afternoon. 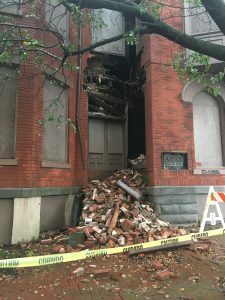 A condemned building in Harrisburg’s Old Fox Ridge neighborhood partially collapsed on Monday night, but city officials said there is no immediate threat to public safety. 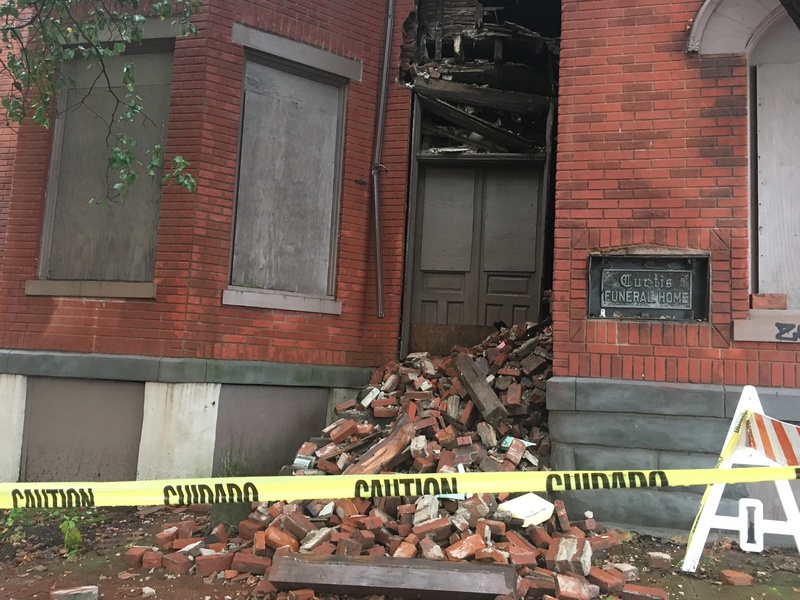 A brick archway at the former Curtis Funeral Home on N. 6th and Boas streets caved in after months of gradual demise, according to witnesses. The event exposed parts of the building’s interior and spilled rubble on to a sidewalk outside. The area outside the property was secured with caution tape and sawhorses by Tuesday afternoon. Harrisburg Mayor Eric Papenfuse said there were no reports of injuries. Papenfuse said that barriers around the property were extended this afternoon, but the city does not believe there is imminent danger of further collapse. Codes administrator Dave Patton said that extensive water infiltration appears to have eroded the brick on the collapsed archway. But he believes the damage is isolated, and said the rest of the structure appeared sound during site visits today. Boas Street resident Ted Hanson, who has been monitoring the property for months, said he wasn’t surprised when the wall finally gave way on Monday night. Hanson laid blame for the derelict property with its owner, Annette Antoun, publisher of the Paxton Herald newspaper. Antoun purchased the circa-1896 building from the Historic Harrisburg Association in the late 1990s. Under former Mayor Steve Reed, the property was flagged as a potential site for an African American history museum. But the neglected building was condemned in 2010, and Antoun was cited for codes violations as recently as October. Antoun suffered a stroke earlier this year, leaving her family in charge of her affairs. Her son, Larry Antoun, said that a structural engineer came to his mother’s property in recent weeks to assess water damage inside the building. But he was not aware of the wall collapse when a Burg reporter contacted him on Tuesday. When he realized the extent of the damage, Antoun insisted he was not responsible for the property’s maintenance. Antoun is correct that his mother remains the legal owner of the building. But multiple sources report that Annette Antoun was incapacitated by her stroke and that her sons have handled her estate. Matt Long, a property developer who is trying to buy the historic funeral home and its adjacent parcel, said Larry Antoun showed him the property and offered to sell it to him for $300,000. “When I called Annette’s to [counter]offer, I was referred back to Larry by his other brother,” Long said. When asked about his role in selling the building, Larry Antoun reiterated that his mother was its owner. 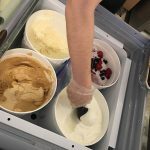 Patton said that one of Antoun’s sons, who has power of attorney for her affairs, is scheduled to visit the property with an engineer tomorrow. Once they determine a plan for securing the building, the city will decide whether or not to press charges for negligence or public nuisance. Long was also not aware of the wall collapse until Tuesday afternoon. He said he’ll have to assess the damage this afternoon, but says he still wants to buy the property if it appears salvageable. After restoring the foundation and interior load-bearing walls, Long hopes to turn the building into apartments. He expected the renovation to cost $400,000 before the recent collapse. Long is also in the midst of buying the historic Jackson Hotel property, just doors down from the Curtis Funeral Home. The property at 1000 N. 6th Street was built in 1896 to house clergy from the nearby Ridge Avenue Methodist Church. Most notable among them was Reverand Silas Swallow, a leader in the Prohibition Party. The so-called Swallow Mansion later became the Curtis Funeral Home, one of many African American-owned businesses on the block, according to Hanson. Once home to a bustling African American business and entertainment district, much of the 1000 block of N. 6th Street fell into disrepair during the post-War “white flight” to the suburbs. The block was redlined by lending agencies in the mid-20th century, and two of its buildings have been demolished in the last two decades, including a historic AME church that was gutted by a fire. Tuesday, Nov. 6: This article was updated to include comments from codes administrator Dave Patton. Wednesday, Nov. 7: An earlier version of this article incorrectly stated that 1000 N. 6th street was built as a private residence; rather, it was built by a church as a home for its clergy. Previous Post Burg Review: Buckle in for a wild, fun ride at Gamut's "Pericles"
Next Post Turnout for midterm election strong in Harrisburg, poll workers say.